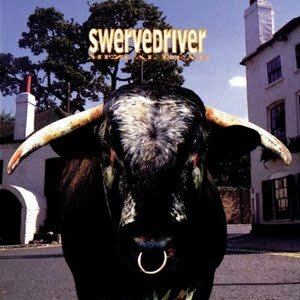 FOREWORD: Oxford, England-based Swervedriver brought hard rockin’ enthusiasm to whirred surrealistic capers in a uniquely fascinating way. Record company problems plagued the band. ‘95s fantastic Ejector Seat Reservation went unreleased in America and by ‘97s admirable 99th Dream, they called it quits. Singer-guitarist Adam Franklin went on to start the just-alright Toshack Highway. In ’08, Swervedriver re-formed to play Coachella Festival. This article originally appeared in Aquarian Weekly. Swervedriver’s psychotropic dreamscapes and provocative allusions comine Raw Power punk energy with sheer noise rock on the trippy escapade, 99th Fream, their fourth long-player since ’91. Defying logical genre identification, this Oxford, England quartet offer impressionistic escapism, twisting melodic psychedelia above huge slabs of searing guitar textures and ruptured rhythms. 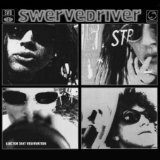 After a few early EP’s gained underground popularity overseas, Swervedriver debuted with the developmental Raise. In’93, the resiliently challenging Mezcal Head extended the futuristic vision of sonic aggro-pop pioneers Jesus & Mary Chain and My Bloody Valentine. Then A & M dropped the band and ‘95s critically acclaimed Ejector Seat Reservation never saw the light of day in the States. Thankfully, New York’s Zero Hour records signed Swervedriver, providing drooling fans with 99th Dream. In January ’98, Swervedriver played a sold-out industry showcase at Manhattan’s Mercury Lounge, mesmerizing the crowd with newly-waxed gems and a few distended versions of vintage tracks. That afternoon I spoke to guitarist Jimmy Hartridge about the new album, touring, favorite artists, and various other points of interest. Many fans want to know if ‘95s Ejector Seat Reservation will ever get officially released in America. JIMMY: It’s a complicated issue. Our American label, A & M, dropped us after Mezcal Head for financial reasons – like it didn’t make a million dollars. When things go wrong, everything does. Then Creation dropped us and made the record a collector’s item. If a Bryan Adams album comes out at the same time as Swervedriver, they’ll put their money on the proven product. Were you intrigued by music as a kid? JIMMY: In England, we have Top Of The Pops, When I was 14, Sweet, Slade, and T. Rex were on. And everyone in England wants to either be a pop star or a football player.Later, when punk came along, anyone could be in a band. You didn’t have to be a virtuoso guitarist. Me and Adam (Franklin: singer-guitarist) grew up in a small village, hung around, and got a band going. Swervedriver’s music is remarkably impressionistic. JIMMY: We don’t plan to have anything come out a certain way. We usually have a basic riff and analyze it when we mix it. Then we texturize it. There’s some interesting Crumar keyboard sounds – an instrument I picked up at a junk shop – and some warbly stuff. We have our own studio in London now. We get to experiment with guitar pitch, feedback, and sustenance. And use some wah-wah guitar. You don’t want to make music too flat and dull. What bands were early inspiration for you? JIMMY: We did a gig in Australia and someone said our power chords reminded them of The Who, but they’re probably more concise then us. Everyone likes The Who. They’re one of those classic bands. I liked their first few punkish, straight down the line albums. They got pompous after Who’s Next. JIMMY: Keith Richards and Kames Williamson and Scott Asheton (the latter two of the Stooges). I could never get into that Jimi Hendrix thing ‘cause I wasn’t good enough. Keith Richards took his bottom string off and made it into a flat chord. I just play what comes naturally to me. On Mezcal Head, noise seemed more important than melodies. Has that shifted for 99th Dream?